For many years remote sensing systems have used many parts of the electromagnetic spectrum to gain more knowledge about the world. Observing near-infrared (NIR) radiation is a key part of that analysis. 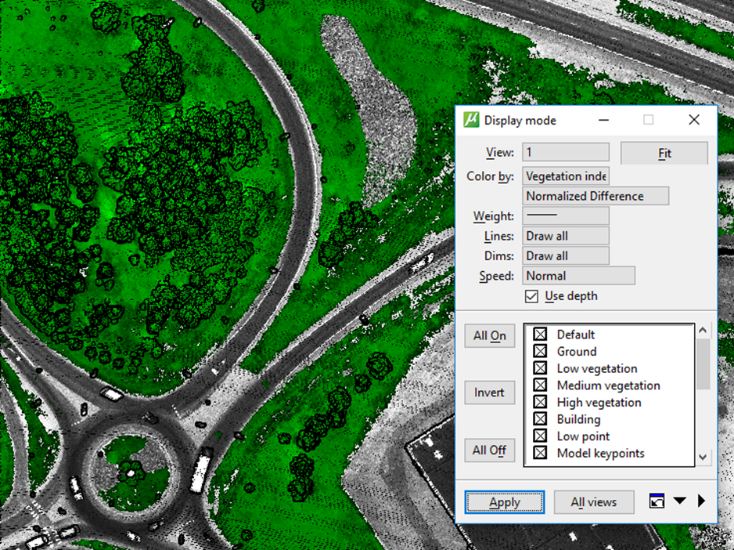 Beginning with TerraScan version 017.030, users have been able to use NIR values to create vegetation indices which provide for new display and classification techniques that can help improve automatic classification results. Where ‘NDVI’ is the Normalized Difference Vegetation Index, ‘NIR’ is the Near-Infrared value, and ‘R’ is the Red value. This results in a value between -1 and 1, where values over 0 signify probable vegetation, and values less than 0 signify probable non-vegetation. Where ‘VBDVI’ is the Visual Band Difference Vegetation Index, ‘G’ is green, ‘R’ is red, and ‘B’ is blue. This method also results in a value between -1 and 1 in the same manner as the NDVI. This method does not require NIR information but is not as reliable as NDVI. TerraScan can now extract the NIR information in addition to the RGB vales from images. In fact, Terrasolid’s Fast Binary (FBI) format can store up to ten color information channels, while LAS 1.4 can store four channels (RGBN), and LAS 1.2 can store only three channels (RGB). Four channels are needed to use the Normalized Difference Vegetation Index method. During the process of extracting color from images to points, the NIR information can also be extracted for LAS 1.4 and FBI formats when it is present in the input images. This is done by specifying the use of four or more channels, as per the “Extract color from images” tool dialog (Figure 1). The fourth channel is hard coded for NIR values in the Terrasolid products, much as it is specified as such in the LAS format. 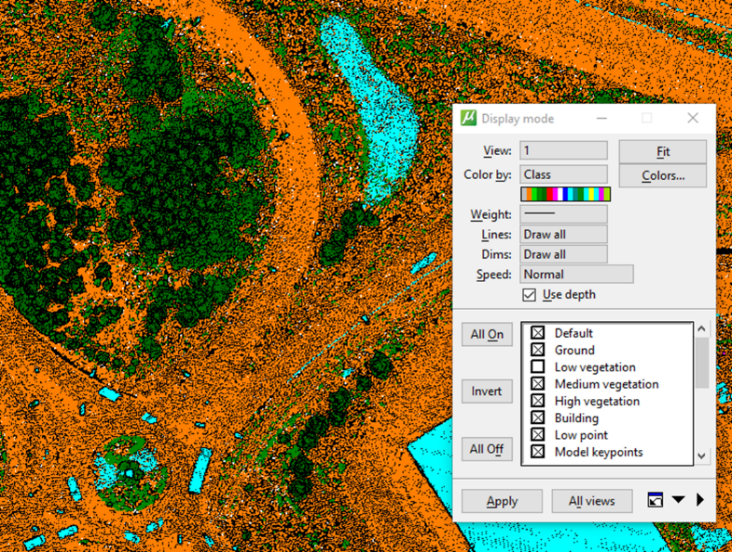 This tool can also use color points created during the image processing phase of a project, and TerraPhoto can incorporate the NIR in the color points to help make for better NIR mosaics. Figure 1: Extract color from images dialog. notice that 4 channels are selected. After the color information is extracted from images, the point cloud can be viewed by color (RGB). A fairly new feature of this display mode is that the user can specify which channels are displayed. The normal color display uses Channels 0(R), 1(G), and 2(B). By changing R to channel 3, the fourth channel, the points that represent high NIR reflectance will be displayed with a reddish tint (Figure 2), also known as color infrared (CIR). If all are set to use channel 3 then the data will be represented by grey-scale NIR values (Figure 2). Figure 2: two ways to view the NIR information in the point cloud. This color extraction also enables a new display mode called “Vegetation index”. It takes the color information and uses the vegetation index equations to compute a vegetation index value for each laser point. The points are then colored based on their vegetation index values (-1 to +1). Any points that have vegetation index values over 0 will be colored green since they probably represent green vegetation (Figure 3). This display mode can represent the vegetation index values based on either the Normalized Difference or the Visual Band Difference equations. Figure 3: Points displayed by Vegetation index using Normalized Difference values. 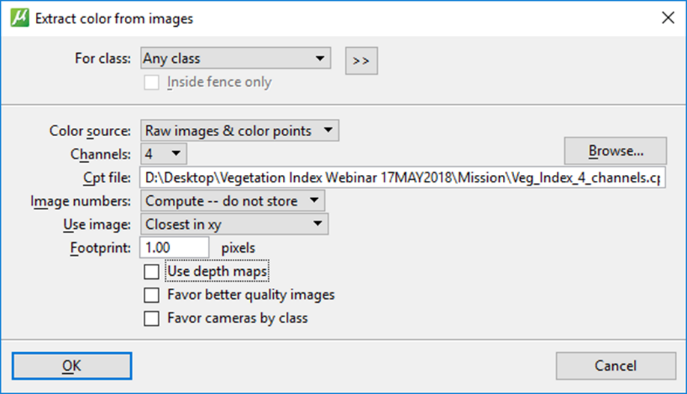 TerraScan can now use this new information to classify points based on the vegetation index value to separate vegetation from non-vegetation points. Two methods are available, much like other classification options, a point-by-point basis or on a group-by-group basis. For example, if the desire is to classify above ground points into a non-vegetation class, then the vegetation index range should be set as -1 to 0 (Figure 4). If the goal is to classify vegetation into a vegetation class, then the range should be set as 0 to +1. Figure 4: Points displayed by class. Light-Blue points are the Man-Made class. The ability to incorporate near-infrared information with point display and point and/or group classification, provides users an additional tool in the toolbox to better discern between vegetation and non-vegetation points. This can be a great asset in general and in situations where vegetation encroaches on target objects. If you have any questions on this new tool or associated workflow, please do not hesitate to contact us at support@geocue.com.